Guest editor Alison has another great story for you! It’s about why looking into your cat’s eyes, observing changes, and seeing the vet once a year is vital to your cat’s health and well being. We think you’ll enjoy this story and learn a few new things too. I went to the local shelter looking for a black and white male kitten, but the only one there had already been chosen. There were SO many kittens in need of homes I couldn’t just leave. I sat on a chair inside the glassed in kitten room while all the furry bundles of energy ran and played around me. Soon a small black female climbed into my lap, grabbed the metal tab and unzipped my jacket. I could hear laughter from outside the enclosure and smiled. I knew I had been chosen. 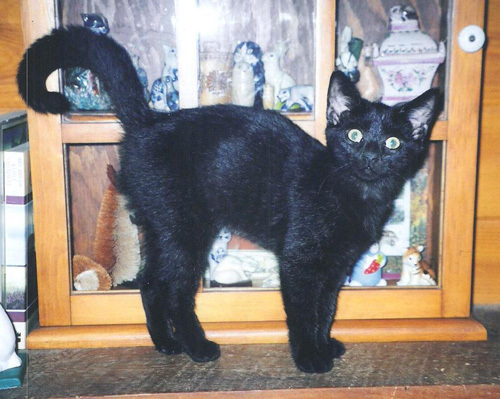 Tommy Lee Jones (Cat in Black) came home with me that day. Many kittens leave shelters either recovering from, or incubating an upper respiratory infection (URI). Of course, I took Tommy to my vet right away for a checkup and she received a clean bill of health. However, I also kept her isolated from my other cats until I felt sure she wasn’t harboring a latent infection that could harm them. According to the American Veterinary Medical Association (AVMA) cats are less likely than dogs to have annual physical exams. In fact, overall veterinary visits for cats decreased 13.5% from 2006 to 2011, while visits for dogs increased 9.2% during the same time period. (https://www.avma.org/news/pressroom/pages/Dog-veterinary-care.aspx) Although there are many possible explanations for the decline, a likely reason is a cat’s natural ability to hide symptoms of ill health. In fact, we may not realize our cats are sick until a disease has progressed significantly. Although there is no substitute for a thorough veterinary exam we can help cats achieve longer healthier lives by becoming more observant as we interact with our feline companions. Even subtle changes could be significant. Who can resist marveling over the beauty of a cat’s eyes? But how often do we look for subtle signs of disease in these windows to their souls? Over the years I started noticing some brown flecks of color in the light green iris of Tommy’s left eye. At first I thought the change was my imagination. Had the flecks always been there? Then a small amount of ocular discharge appeared. She didn’t act as if the eye was painful or irritated, but a visit to the veterinary clinic was definitely in order. Fortunately it was nothing serious. The overall condition was diagnosed as iris melanosis. If the spots had been raised, rather than flat, she might have lost an eye to cancer. He suspected that part of her problem was a herpes virus (not contagious to humans) most likely acquired from an upper respiratory infection (URI) as a young kitten. Herpes virus can remain latent until stress or illness trigger the recurrence of clinical signs. Tommy’s eyes are now examined regularly to be sure the pigmented areas do not become raised. She is also taking an amino acid supplement, L-lysine, to reduce the likelihood of herpes flare ups and potential corneal ulcers. However, I still can’t convince her to wear sunglasses. Introducing Bixbi Organic Pet Superfood supplements – four formulas to benefit your cat (and dog). Cat Faeries is so pleased to introduce you and your cats to these Organic Pet Superfood supplements from Bixbi. When an elderly dog friend made huge strides in his health we knew we had to check it out to see how these four superfood supplements might benefit cats. And boy do they! Each ingredient is organically grown or produced, and just as impressive: they are all sourced or grown in the US! You know us, we are against ingredients from China and similar countries. Choose your formula or formulas and simply add the powder to your cat’s food – dry crunchies, canned cat food, or homemade cat food. Now you can boost your cat’s health and vitality in an affordable and easy way. Digestion – Packed with thousands of natural enzymes, antioxidants and immune-modulating compounds. This unique blend of powerful organic, US grown mushrooms contains naturally occurring B-vitamins to help convert food to energy for everyday activity and fighting disease. And DIGESTION improves digestive efficiency while combating gas, loose stools and bad breath. 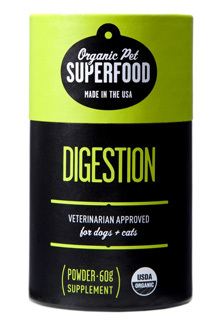 Give your cat’s diet the support it needs with DIGESTION in every meal. Immunity – Potent antioxidants such as L-Ergothioneine, selenium and vitamins C & E prevent damage caused by stress, infection, pollution and aging. The polysaccharides in our unique blend of powerful organic mushrooms improve natural killer and T-helper cell activity, and work to balance the immune system. Give your furry friend its best defense by using IMMUNITY every day. Joints – Packed with natural antioxidants, our unique medicinal mushroom formula fights free radical cell damage caused by age, exercise and stress. It aids circulation, eliminates toxins and fights inflammation at the source. And JOINTS is made with NEM® (Natural Eggshell Membrane) — clinically proven to reduce joint and soft tissue pain. Keep your cat/dog moving with JOINTS. Skin and Coat – Whole food antioxidants and B-vitamins provide key nutrition while nourishing the skin and reducing free radical damage at the cellular level. SKIN+COAT’s unique organic mushroom formula also contains natural immune modulators which balance overactive antibody responses — the cause of itchy skin, rashes and excessive shedding in pets with allergies. With SKIN+COAT, your cat (or dog) will look and feel the very best. More detail about the benefits of each formula and the ideal serving size can be found on the Healthy Cats page on our website. 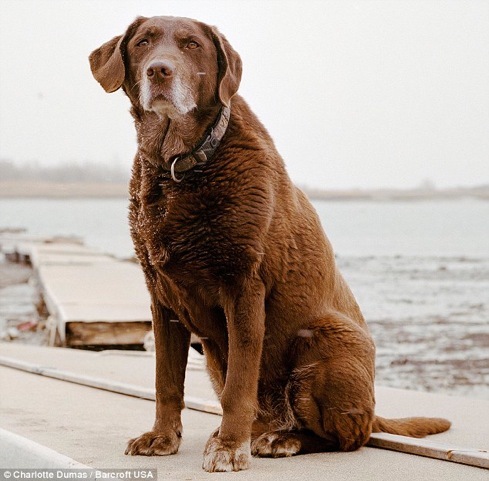 Our blog post on the rescue dogs of 9/11 went viral and was seen by 120,000 people! My goodness! Our blog post of a year ago on the rescue dogs of 9/11 went viral last Wednesday on Facebook and Twitter. Who knew that so many people would respond so overwhelmingly – 120,000 visitors and 58,000 Facebook likes! It was so many of you that it fried our blog as it went viral! Our blog needed an overnight catnap to recover. But like any cat, it landed on its feet and it is back in action. Thank you for visiting, and thank you for caring! It’s very hard work being a couple of cute Japanese kittens on Cat Heaven Island. Time for a short power nap. 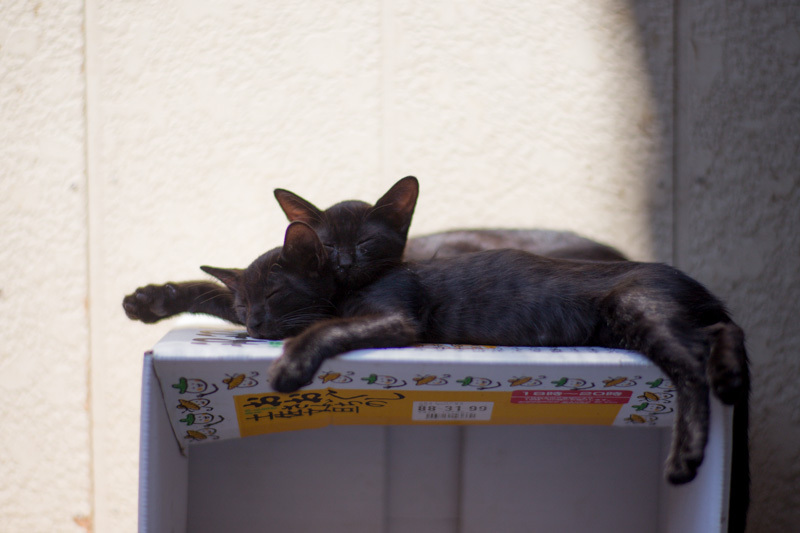 Feline blood bank could save your cat’s life! A blood bank for cats! Maybe your next cat will be a retired blood donor! Because I donate blood regularly at my local blood bank I wondered if there are blood banks for cats. I learned that there are blood banks for animals, but most are dog blood banks and a few also have reserves of cat blood. Those banks which do are large operations and we aren’t so sure what happens to the cats when they “retire” from the blood draws because many of them do not have active adoption programs for retired donors. But we found a blood bank just for cats and it won our hearts. Nine Lives Blood Services is the only blood bank for cats exclusively. They are a small, compassionate 2 person operation in Lansing, Michigan. Nine Lives Blood Services was founded by Alice Parr because of her love for cats and their needs which often get ignored. She was a Licensed Vet Tech at the Emergency and Critical Care Unit at Michigan State University Veterinary Teaching Hospital for 30 years. Her co-founded is double degreed veterinarian and MBA, Kath Edsall. Not only do they humanely collect and ship feline blood all over the US, they are active in finding forever homes for their retired feline blood donors and they are passionate about all things relating to cats. B: there is a higher incidence of this blood type of several pure bred cats, including British Shorthair, Rex, and Somali. Many of the cats in Australia are type B. How does the blood bank acquire the blood? The cats come from shelters and live with Alice for about 18 months in a closed colony. After 18 months the cats are returned to the shelter where they are put up for adoption. Nine Lives Blood Services are very active in feline adoption, particularly of older cats. While the cats are in Alice’s care 45 milliliters or 3 Tablespoons of blood are drawn every 3 or 4 weeks. Are there any side effects? Alice tells us there are very few, but sometimes a cat won’t regenerate red cells quickly enough to donate every 3 weeks. Before taking the blood the cat is given a mild sedative and blood is drawn from a vein in the neck. What we love about Nine Lives Blood Services is that Alice and Kath try to only use the cats for 18 months, which is unlike many other blood banks which might keep a cat until they can no longer give blood. Cat Faeries has a customer who adopted such a cat and the cat was under socialized and had a hard time adjusting to a house and home. Can a cat benefit from a dog’s blood? Alice Parr tells us that it can be done, but that it’s extremely dangerous and the results can easily be fatal. We recently stumbled upon a video about how a dog’s blood saved the life of a cat. The reason we aren’t posting it here is that the cat was lucky. 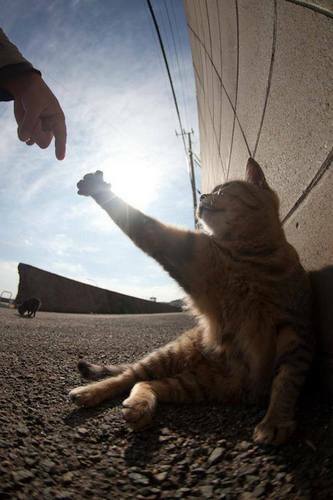 Most cats would not have survived the blood transfusion from a dog or from an animal of another species. Is the blood of our domestic felines and the blood of the big cats the same? Yes! Isn’t that a fun fact? Can my cat be a feline blood donor? Let’s picture the feline fantasy . . . .Madame Fluffy Tail holding out one manicured front paw while the attendant, Nurse Whiskers, draws the blood promising Madame Fluffy Tail a massage and a bowl of mouse pate’ to reward her for bravery and love for her feline brothers and sisters. But that’s all in fun. The reality is: probably not. Cats being cats they do require some mild sedation and it would be most likely be too stressful for everyone. But it’s good you want to help cats! You can do that by telling your vet and rescue groups about the good people of Nine Lives Blood Services. After a cat’s 18 month stay the cat goes back to the shelter for adoption. One of the pluses about adopting one of these cats is that they are used to being with a group of cats and thus might be an ideal addition to your multi cat household. Dear Reader, do you donate blood? If you haven’t donated blood recently or have never done it and would like to, find your local blood bank and call today. You’ll give one unit of blood which will help one other person! I time my donations so that I’ve had a lot of water and a big breakfast, and so that I’m done before lunch time. You are required to sit in the canteen area for a period of time to rest and eat. I take my own water, chocolate bar, and food to the canteen because to me what they provide is really junky and full of gluten. And someone drives me home. The rest of the day is pretty mellow – no exercise, no hard work, a lot of reading and relaxing, and the best of all they tell you to eat hardily! A quiz! Do you remember which ad slogan said “reach out and touch someone?” No peeking on Google!